The Funky Felter: It's Bunny Friday! Ode to the Junior bunny! It's Bunny Friday! Ode to the Junior bunny! Okay, so I decided to declare this one Friday as a Bunny Friday. "Why?" You might ask. Or, you might think "That's just silly!" 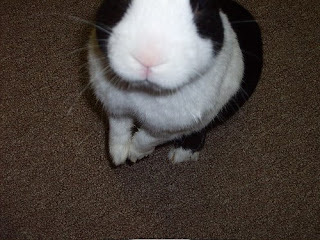 Well, perhaps I am silly as a loon, but for no other reason, I declare it Bunny Friday because bunnies are darn cute. Yes, you saw right, they're darn cute! And, everyone needs a little cute on Friday. The labor of your work week is over so now relax and check out some adorable bunnies. First up is my own bunny, Junior! Ode to the Junior bunny! 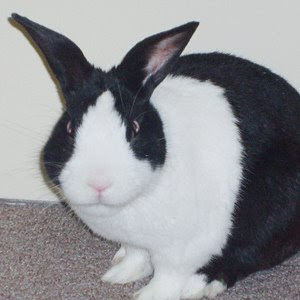 He's a black and white Dutch Rabbit who turned six years old this year. For an older bunny, he's still full of energy and very spunky. One of my favorite parts of any day is when I get to cuddle with Junior. He's great at cuddling! 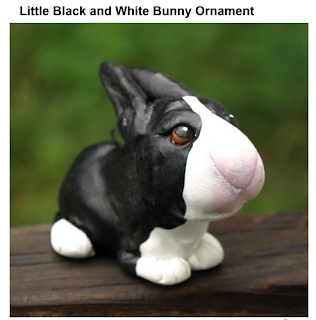 I also wanted to share two absolutely adorable Junior look-a-likes that I found on Etsy. 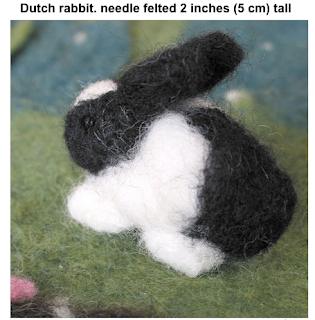 One is a needle felted bunny by dolittledesign. The other is a bunny ornament by cbarjcrafts. They can never be as sweet, cute, and lovable as my own Junior bunny, but they are the next best thing. Please visit these artists shops for more of their handmade items. Spread the bunny love of Bunny Friday! My goodness, those are so cute!!! Hurray for Junior Bunny!!! I just dunno if Friday can be any cuter now. Junior is so cute! What a sweety! Love his felted look-a-like too! The bunny theme is so adorable!